New York Knicks star Carmelo Anthony plans to opt out of the last year of his contract and “test the waters” of free agency this summer, with teams like Chicago, Houston, and the Los Angeles Clippers all expected to show interest. While Anthony has said that his top priority is to re-sign with the Knicks, it’s tricky: He’s looking for assurances from Knicks President Phil Jackson that the team is committed to rebuilding, but Jackson also knows it means a significant pay cut for Anthony. Undoubtedly, Anthony has been a force in the league. He has scored nearly 20,000 points in his career and appeared in the All-Star game seven times. He is the fifth-highest paid player in the league and was the regular season’s second-leading scorer, after Kevin Durant. Some say he’s one of the best players in the league, third only to LeBron James and Durant. But what about numbers? In a recent Atlantic piece, David Berri makes the case that the National Basketball Association forward isn’t as valuable to the Knicks as their fans – or their front office – think. We break down six reasons this may be true. In the 2013-2014 regular season, Berri writes that an “average NBA player had an effective field goal percentage (a measure that considers the impact of shooting from two-point and three-point range) of 0.501 and a true shooting percentage (a measure that considers the impact of shooting from the free throw line and the field) of 0.541.” Anthony’s stats put him at a 0.503 effective field goal percentage and a 0.561 true shooting percentage, making him only marginally better than the average player at putting the ball through the hoop. “Wins produced” is a model for estimating individual player contribution to winning and is calculated through box score statistics tracked by the NBA. Taking into account two of the league’s contenders for MVP and pitting them against Anthony, we see the disparity: In the regular season, Durant produced 19.4 wins, James produced 17.8 wins, and Anthony produced just 6.9 wins. This isn’t just a number limited to the 2013-2014 season, either. Berri reports that in the 2012-2013 season, James produced 21.1 wins, Durant produced 19.2 wins, and Anthony only produced 4.1 wins. This is largely the result of Anthony’s effective field goal percentage and true shooting percentages, which linger close to average, while James and Durant’s figures are significantly higher. Sure, we can compare Anthony to James and Durant, but what about when we look at his numbers across the league? Across teams? “Six teams had higher true shooting percentages than Anthony last year,” Berri wrote in The Atlantic. “In fact, on the San Antonio Spurs alone, nine of their 12 players with more than 500 minutes on the court this year posted a higher true shooting percentage than Anthony.” Half a dozen teams that collectively score more efficiently than one of the “best” scorers in the league? The results don’t look good for Anthony. Despite Anthony asking for a stronger supporting cast, a different story emerges when statistics are taken into account. For this, we turn to the number of wins produced by the supporting casts of the Heat, Thunder, and Knicks: “In 2012-13, the wins produced by everyone on the Heat not named LeBron was 41.0. And when we look at the Oklahoma City Thunder, everyone not named Durant produced 46.3 wins. So each of these players had ‘help.’ But perhaps surprisingly, Anthony had even more help. 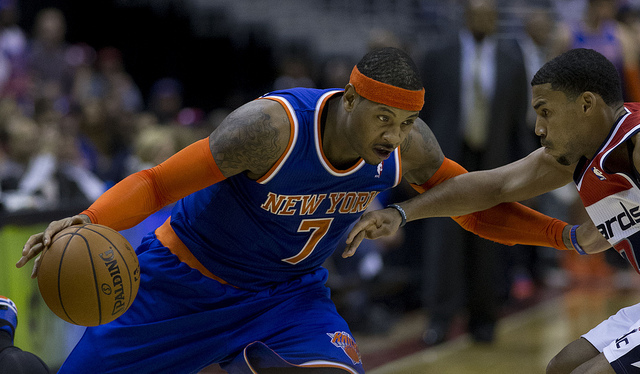 In 2012-13, everyone not named Carmelo on the Knicks produced 48.0 wins,” Berri said. Admittedly, the Knicks saw some setbacks in the 2013-2014 season — among them, the injury of Tyson Chandler, the loss of Jason Kidd, and the negative production of wins by Andrea Bargnani. Even with all these changes, however, the disparities between teams are not so great: “[E]very player not named Durant on the Thunder produced 38.5 wins, every player not named James on the Heat produced 36.0 wins, and every player not named Anthony on the Knicks produced 32.0 wins,” writes Berri. Someone had to say it. In the NBA, age is more than a number: It’s usually a representative number. Statistics tell us that players age in a “U-shape,” meaning they gradually get better as they reach 25, peak between 25-26, slowly decline around 30, and then rapidly decline around 32. Anthony will turn 30 on May 29. The NBA’s collective bargaining agreement allows the Knicks to offer Anthony a five-year maximum deal of $129.1 million to stay in New York, which would put him at 35 when the contract expires. Worth it? We’ll see. In his 11 seasons in the NBA, Anthony has only advanced out of the first round of the playoffs twice in his career. This year was the first time in the pros that Anthony hasn’t even made it to the playoffs, something Carmelo said has made everything “cloudy” for him and his future. With Jackson acting as an undoubtedly positive addition to the Knicks franchise, it’s evident that the winds of change are brewing at Madison Square Garden. Only time will tell if Anthony will be around as a beneficiary.